Meet the new Neutron XTi line. Corsair launched a new line of SSDs today, the Neutron XTi series, which pairs the "blisteringly quick quad-core Phison" controller with multi-level cell (MLC) NAND flash memory. Chalk that up to marketing hype over what's probably the Phison S10 controller, a decent but not necessarily exceptional controller, though for gaming storage it's more than sufficient. It's the same controller used in Patriot's Ignite series, which recently got a bump in capacity to 2TB. Not to be outdone, Corsair also plans to offer a 2TB-class option (1,920MB) as part of its Neutron XTi series sometime in the "near future." When it emerges, it will be Corsair's highest capacity SSD to date. In the meantime, the Neutron XTi series is represented by 240GB, 480GB, and 960GB capacities. These are all SATA 6Gbps drives so you don't get the kind of obscene performance numbers that PCIe-based drives offer, but as far as SATA drives go, many can hit the SATA bottleneck—Corsair rates sequential read and write transfers at up to 560MB/s and 540MB/s, respectively, along with up to 100,000 IOPS of 4K random read and up to 90,000 IOPS of 4K random write performance. "Designed for consistent performance the Neutron Series XTi handles very high sustained transfer rates with ease, enabled by an expanded cache making it possible to capture and edit professional Full HD and 4K uncompressed video in real-time, as well as play PC games with absolute maximum detail levels," Corsair says. The Neutron XTi series is also equipped with end-to-end data path protection (ETEP), along with SmartECC and SmartRefresh to improve data retention and error correction. 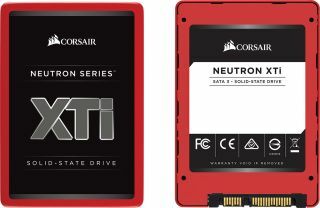 Corsair says the Neutron XTi series will be available today priced at $90 for 240GB, $160 for 480GB, and $330 for 960GB. Pricing for the forthcoming 2TB model hasn't been determined yet.